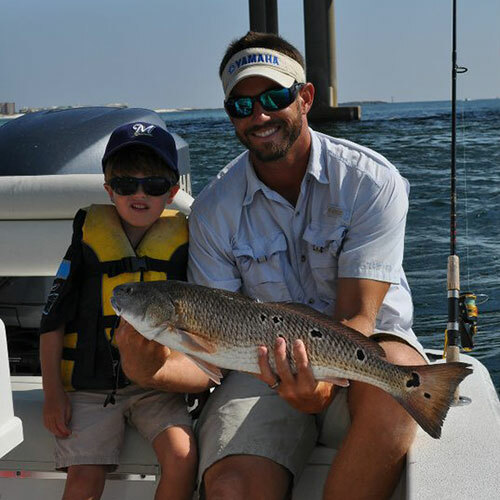 Destin Inshore Fishing at its Best! 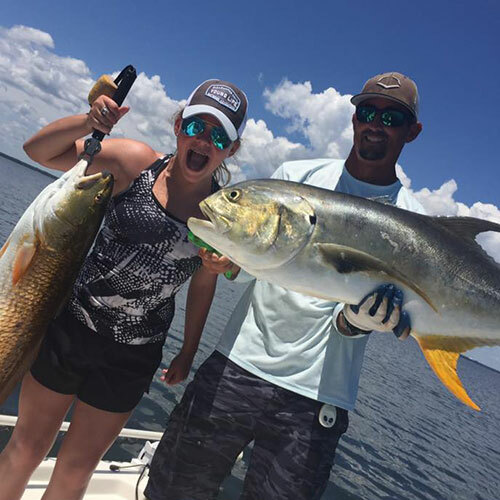 Last Cast Charters is dedicated to providing you with the best inshore fishing trip possible. 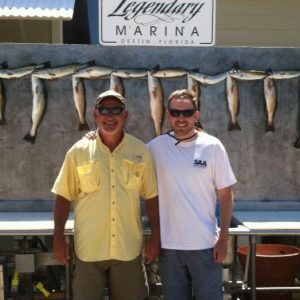 We specialize in light tackle fishing for speckled trout, redfish, and flounder with both artificial and live bait. All our captains are great with kids and treat people the way we would want to be treated. We are now booking for 2019 by phone call or text (850-499-3811) – quickest via text. 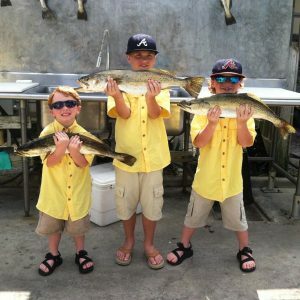 How do I book a Destin inshore fishing trip? Give me, Captain Blake, a call or text at (850) 499-3811 and make a reservation. All reservations require a $100 non-refundable deposit (which will be refunded if bad weather permits). Remaining amount is paid after the charter via cash or check. What is your cancellation policy? We have a 48 hour cancellation policy. If you decide to cancel your reservation within 48 hours of the scheduled charter, the credit card on file will be charged the full amount of the price of the charter. 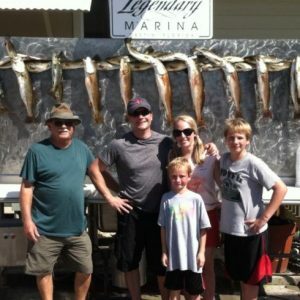 What does Last Cast Charters provide? 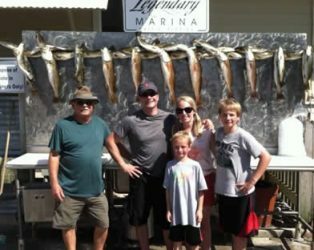 Fully equipped boat, experienced captain, bait, all fishing gear, fishing licenses, ice (for fish), the best fishing spots in Destin, and we will clean and bag your fish once we’re done. How many people can go on a charter? My rates are for up to 4 people, but we can accommodate up to 6 for an additional $50 per 5th and 6th person. For larger groups, I can set up additional boats. For additional boats, book as far out as possible to ensure other boats will be available. Where are you located? Last Cast Charters is located at the southern end of the Mid-Bay bridge (SR 293) at Legendary Marine, in Destin (large building with whales painted on it). We’ll meet on Dock E.
What do I need to bring? Sunscreen, sunglasses, hat, snacks, drinks, and a camera. What are we going to catch? 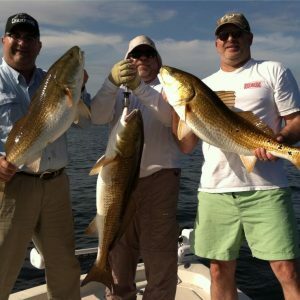 The two main fish that we will target will be speckled trout and redfish. 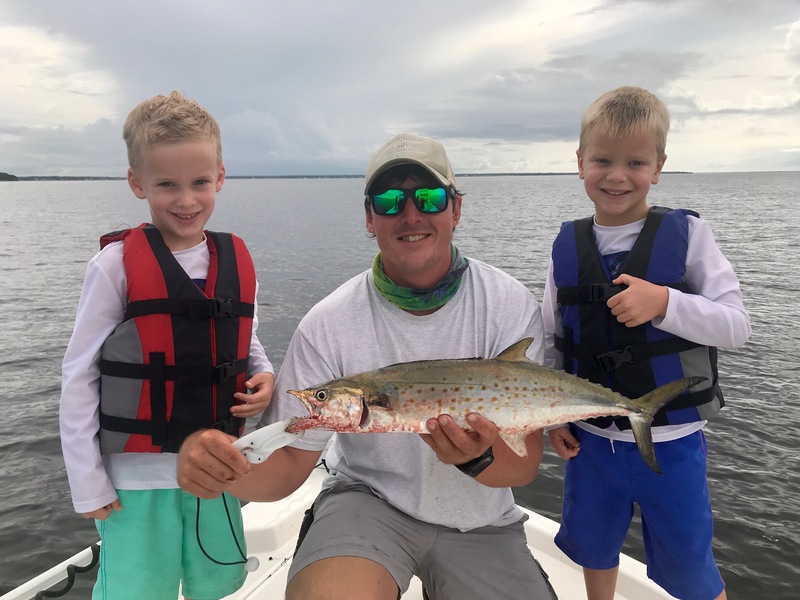 But depending on the time of the year and/or your preferences we will also catch bluefish, spanish and king mackerel, flounder, sheepshead, pompano, tarpon, cobia, black drum, sharks, and some trash fish that sneak in from time to time. Are the fish any good to eat? Yes. Most of the fish we catch are good to eat. 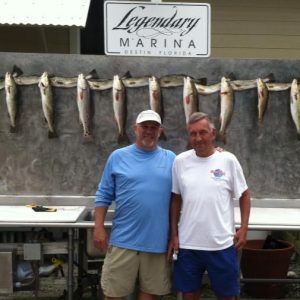 The two main fish that we target, speckled trout and redfish, are very good. A personal favorite is blackened redfish. What do we do if it rains? I leave this decision up to you. The fish bite rain or shine so if you have some good rain gear and an adventurous spirit, we’ll go fishing in the rain. However, I will not fish in any weather that will put myself or my clients in any danger such as a torrential downpour, heavy winds, any lightning, or heavy fog. Is the fishing any good in the winter? Yes. 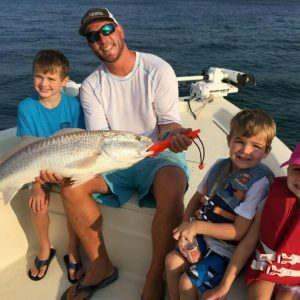 It can get chilly along the panhandle during the winter months but the fishing doesn’t slow down at all. What should we wear? Always prepare for cooler weather than expected. You can always shed layers, there is plenty of storage space in the boat. 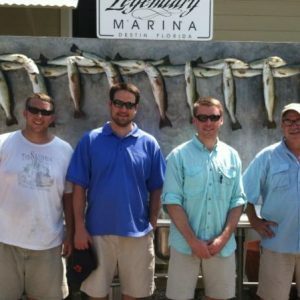 All four of us grew up in the Destin area and have fished the local waters our entire lives. 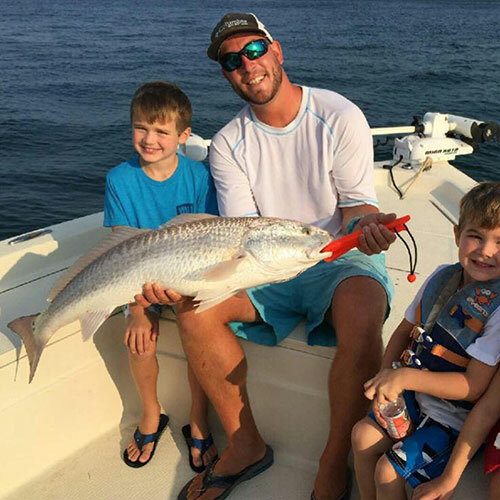 We all have a passion for being out on the water and giving people a great experience catching fish. We fish out of 24 ft Skeeter bay boats. All three boats are fully rigged with Power-Pole Shallow water anchors, top of the line electronics, Minn Kota trolling motors, Yamaha four stroke motors, and enough space to accommodate up to 6 people. 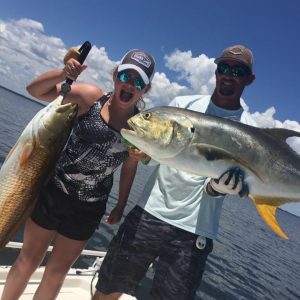 Stay updated with the tournaments that we fish throughout the year.